The World Intellectual Property Organization Program and Budget Committee (PBC), a key member-state body at the UN agency, today opened a week of work on a range of issues. Opening the meeting, WIPO Director General Francis Gurry highlighted the positive financial status of the organisation but cautioned that external factors could make it risky to continue its heavy dependence on the popular Patent Cooperation Treaty. Gurry noted that as in recent years, WIPO’s income was higher than budgeted, since it typically uses a “cautious approach” in budgeting. But the Patent Cooperation Treaty, under which patent holders in member countries can file an international patent to seek protection in other member countries, still makes up 75 percent of WIPO’s revenue, he said. In the last year, it again outperformed estimates, and is considered an “extremely important” system for the organisation, he said. The PCT has some 152 members. Gurry noted that a “quite extraordinary” amount of work goes into the PCT both by WIPO and the governments. Meanwhile, the Madrid system on marks also contributes a significant portion of the remainder of WIPO’s revenue, and is slowly seeing a steady increase in members, and is “now becoming a very interesting system,” he said, with the expectation of significant growth in coming years. The Madrid Union has 101 members, covering 117 countries, according to the WIPO website. Madrid system fees for 2017 were CHF 70 million, or 16.9 percent of the total, according to a PBC document [pdf] (see page 8), as noted by a WIPO press officer. The third system managed by WIPO, the Hague system on industrial design, is a smaller percent of the budget but is “in movement,” Gurry said, making it more attractive and, WIPO hopes, an increase in demand. Well under 10 percent of WIPO’s revenue typically comes from government funding, unlike other UN agencies. Gurry also reported on progress in WIPO investment strategy since it was given responsibility for its investment decisions last year. He said that while interest rates have been negative in Switzerland in that time, it appears WIPO has been able to avoid a negative result. The agency needs a longer term policy than the current 5 years, he said. He also said the organisation is conducting an experiment with “netting” payments under the PCT, which by allowing net payments to be made could help reduce exposure of WIPO and member states to fluctuations in exchange rates. Intellectual Property Watch prepared a full preview to this week’s meeting here (IPW, WIPO, 7 September 2018). At the outset of the meeting, a new chair was named to lead the committee for the remainder of 2018 and 2019: Andrew Staines, UK Ambassador and Deputy Permanent Representative to World Trade Organization, World Intellectual Property Organization and UN, Geneva. Another change announced is that the United Kingdom National Audit Office will take over the role of external auditor of WIPO, for a six-year term. The outgoing external auditor was Rajiv Mehrishi as the Comptroller and Auditor General of India. 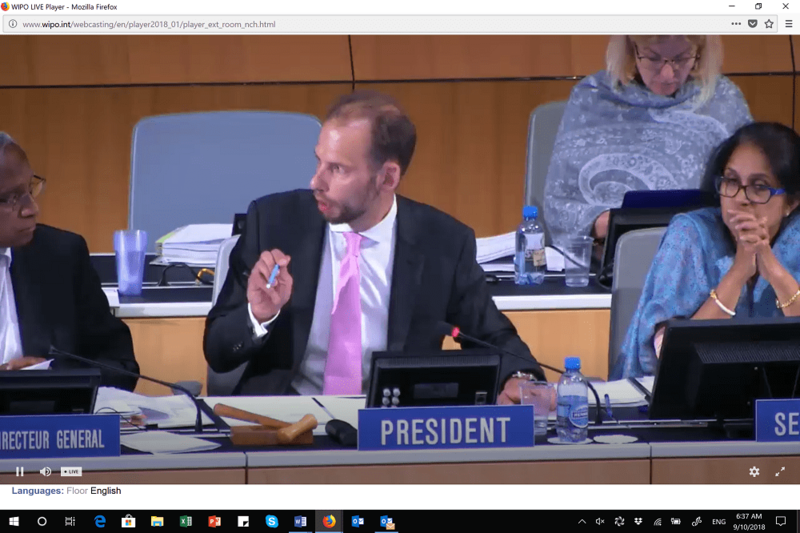 "WIPO Looks To Diversify Its Revenue Sources From High Dependence On PCT" by Intellectual Property Watch is licensed under a Creative Commons Attribution-NonCommercial-ShareAlike 4.0 International License.